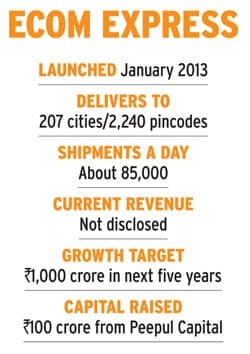 Start-ups in E-commerce logistics are moving fast even as the biggies get their act together. At a recently held e-tailing event in Gurgaon, near Delhi, the chief executive of a logistics company, while narrating his own experience, succinctly spelled out what lies ahead for the industry. During the festive season of Diwali, he was expecting the number of orders to double but instead it went up by four to five times and led to a logjam. "I don't know what will happen next year. Only the entry of start-ups would help bridge the demand-supply gap," he said. There has been no doubt about the growth prospects of e-commerce in India. According to the Gurgaon-based consultancy Technopak, the $2.3-billion (Rs 13,800 crore) Indian e-tailing sector will touch $32 billion (Rs 1.92 lakh crore) by 2020. But for this to happen, the logistics sector - the link between e-tailers and customers - must keep pace with the rate of growth in e-commerce. And it is here that start-ups are playing a key role. The sector has its own challenges. One of them is scaling up. At the e-tailing event, after a discussion on this topic by Kishore Biyani, CEO of Future Group, when the floor was thrown open for questions, someone asked, "How do we ready ourselves to meet the sudden spurt in orders, say a day ahead of Diwali?" Biyani in return asked a couple of questions. "Do you really want to expand capacity for that one day of big sales? What would you do with those resources afterwards?" Be it the new or the old established players, the challenge lies in predicting demand, its peaks and troughs, and remaining prepared. Most logistic companies seem to anticipate the jump in order volumes at least for the next year or two, and prepare accordingly. Gurgaon-based start-up ECOM Express is one of them. "From about one lakh shipments a day we will have to handle about two to three lakh in a couple of years or so," says K. Satyanarayana, its Co-Founder and Director. He along with three other colleagues at Blue Dart Express Ltd - T.A. 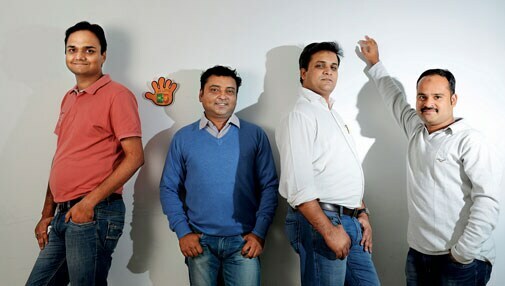 Krishnan, Sanjeev Saxena and Manju Dhawan - had quit the firm to start ECOM Express in January 2013. 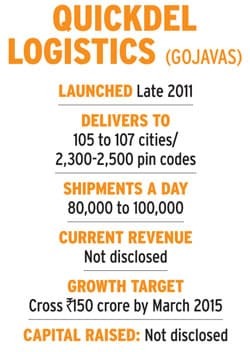 The rapid strides in the e-commerce sector can be gauged from the growth of another start-up, Quickdel Logistics, which owns the delivery brand GoJavas. Launched two-and-a-half years ago, its first client was Jabong, the online fashion and lifestyle retailer. Today, it serves 200 companies, delivers at 2,300 pin codes and covers about 105 cities. According to Vijay Ghadge, COO, the company shipped five million packages in 2013/14 and expects to ship 20 million in 2014/15. He expects the company to earn Rs 150 crore in revenue by March 2015. Another start-up, Gurgaon-based Delhivery, earned Rs 64 crore in revenue in 2013/14 and expects to close the current financial year with Rs 220 crore to Rs 240 crore. Delhivery was started in April 2011 by Sahil Barua and two others who worked at Bain and Company, a consulting firm. All these start-ups work closely with customers and have tailor-made their services to suit customer needs. "When Zivame, the lingerie e-tailer, told us to send only girls for deliveries, we were open to that," says Satyanarayana. The firm has also set up small offices in high-density residential areas for faster shipments. Meanwhile, GoJavas has trained its deliver boys to pacify disgruntled customers by showing them the proof of their effort to deliver goods on time. E-commerce companies vouch for the flexibility of these start-ups. "They are tuned in to our requirements," says Praveen Sinha, CEO of Jabong. Sinha, like other online retailers, works with 10 logistics companies. But the survival and funding of a start-up depends on how it differentiates from its competitors. "After all, anyone with 15 bikes can start up,"says Barua of Delhivery. Though many times the new innovative ways of one logistics firm are copied by others, some remain unique. Quickdel was the first to launch open-box deliveries wherein customers could open and check the packet delivered to them before making the payment. But it was later on taken up by many logistic players. "But some features like tracking the delivery boy on Google maps on the company's website have been hard to copy," says Ghadge, who gets new ideas from customer complaints. Meanwhile, older courier companies like Blue Dart and DTDC, which had six years ago taken Flipkart lightly forcing it to start its own logistics services eKart, are waking up to the e-commerce opportunities. They have either set up separate verticals or have allocated a chunk of resources to cater to e-commerce. DTDC, for instance, launched Dotzot in June 2013. But the transition from serving only businesses to end-consumers has been challenging. "It requires minute changes everywhere. We have been handling cash for years and that was just 0.1 per cent of our business. But thanks to cash-on-delivery (COD), we have now become a quasi cash-management company," says Sanjiv Kathuria, Co-founder and CEO of Dotzot. Locating residential addresses in small towns and doing reverse logistics by way of picking up the packet from customer's place back to the e-tailer's warehouse was another complexity to solve. In anticipation of growing demand, the start-ups are now busy expanding their network. Delhivery plans to cover 175 cities by March 2015 and also expand its operations to west and south Asia. 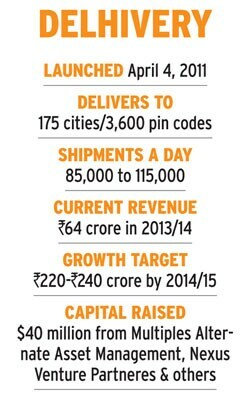 ECOM Express now covers 2,000 pin codes and has 42 delivery centres spread across 35 cities in north India. The company now plans to expand to Bangalore and Mumbai and also move south. It had reached Kashmir in July and gets 2,500 to 3,000 orders a day from the region as compared to Gati's average of 2,000 shipments a day. Start-ups are investing in automation to handle more volumes. ECOM Express has started using robotics sorting technology instead of manual sorting of packages. This will help the company scale up processing from 60,000 to 70,000 packages a day to 1.3 lakh. The big players too are expanding. They already have a large network and are now spreading to tier II, III and IV towns with more manpower and a fleet of vehicles. Dotzot, for instance, is planning to set up over 200 pick-up and drop-off points for customers in metros. Gati already has a network that covers 16,500 pin codes. It has launched Gati Connect that allows sellers to buy branded packaging products on one of its clients' websites. It has also launched secondary packaging services for white goods such as refrigerators. Most companies are trying to fast become end-to-end service providers. Delhivery offers services ranging from last-mile deliveries, third-party fulfilment, warehousing services and software solutions such as channel integration software for sellers selling across multiple platforms. Holisol Logistics, which started in 2009, offers warehouse consulting solutions. A year ago it expanded to deliveries. "Logistics is becoming an information management business. 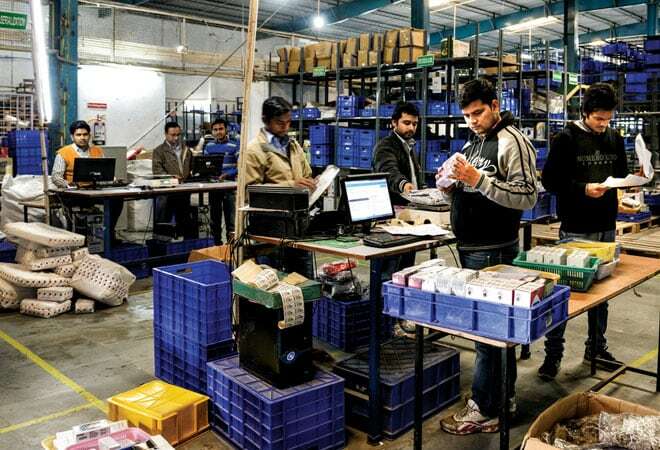 Customers prefer to work with a single vendor for logistics, warehousing and fulfilment services for seamless flow of information," says Naveen Rawat, its Director. The company has set up a one-lakh-sq-ft warehouse for Jabong and a 1.6-lakh-sq-ft warehouse for FabFurnish at Jamalpur and Bilaspur in Gurgaon, respectively. The firm offers delivery services for e-taliers like Jabong and Freecultr and offline sellers like Raymond and Biba Apparels. However, for e-tailers, the priority is good service at the right price, even if that means multiple service providers. "We would prefer outsourcing things to whoever does it the best," says Sinha of Jabong. With the competition between start-ups and traditional courier companies hotting up even at the order level, e-commerce companies have built strong algorithms to automatically allocate deliveries based on multiple criteria such as the logistics company's reach, efficiency in handling payments and customer response. The road ahead, however, is full of challenges for all logistics players. Different tax structure in different states can slow down the pace of growth. For instance, ECOM Express has not expanded to eastern states and Kerala. "Until the Goods and Services Tax is in place, this is going to be a grey area in understanding the business model that would work in some states," says Satyanarayana. Poor infrastructure is another big hurdle. "Unlike other countries, commercial planes required to meet the demands of air cargo are absent. There was logjam at the Delhi airport during Diwali. We had to move cargoes to other airports like Jaipur or Chandigarh," he says. There is also a need for a faster remittance cycle as about 70 per cent of the deliveries are COD. Add to all this the shortage of manpower. "No matter how much companies invest in technology, it is a very people-oriented business," says Rawat of Holisol. Retaining manpower too is tough. "Delivery guys change jobs for a marginal difference of Rs 500," says Dhruv Agarwal, Vice President, Supply Chain Management at Gati. At a time when slow growth could prove to be a killer, capital has also proved to be a big constraint. "You need to expand to not two but 50 cities in a go. That needs loads of capital," says Rawat, who raised $1.5 million nine months ago from private equity firm Datavision. "Given the amount of capital raised by e-commerce companies, logistics firms would need at least $500 million to $750 million to match their scale of growth in the next few years," says Barua of Delhivery. "For the bigger companies, the conflict would be whether to invest more capital in expanding their existing business or e-commerce." While earlier entrants like Chhotu, owned by Santa Claus Couriers, have shut shop for want of follow-on funding and a proper business model, at least two start-ups - Delhivery and ECOM Express - have raised sizeable funding. Delhivery raised $35 million in Series C round of investment led by private equity firm Multiples Alternate Asset Management in September 2014. In 2013, it had raised $5 million from Nexus Venture Partners. ECOM Express raised over Rs 100 crore from private equity firm Peepul Capital in September 2014. Delhivery is also open to acquiring new entrants who can offer strong specialisation. "We could look at companies that are specialising in rural deliveries or those offering new products like try-and-buy," says Barua. The firm had acquired offline cash-collection start-up Gharpay in June 2014. The focus on investments and fast expansion is, however, taking a toll on profitability. While ECOM Express is not profitable yet, Quickdel claims to be so. For biggies, profit is not a worry. "Margins in e-commerce are better by one to two percentage points than our B2B business. We have always been profitable," says Agarwal at Gati. "It has not been like building a brand new business."